Woolly Mammoth fossil at La Brea Tar Pits, California: photo © 1990 David Morgan-Mar: DM's Photo Gallery (used by permission). Giant grass-eaters of the Ice Age tundra, the woolly mammoth stood 10-12 feet (3-3.7 meters) tall at the shoulder and weighed 6-8 tons. 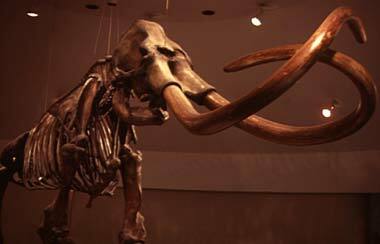 Nebraska also designates the mammoth as a state symbol, and Michigan recognizes the giant mastodon. 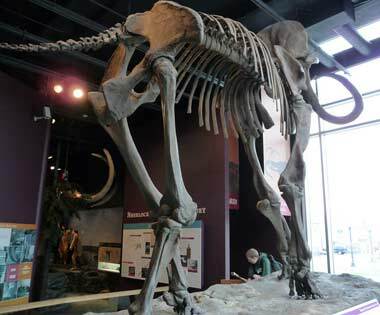 Mastodons had straighter tusks than the woolly mammoth, and both the body and head of the mastodon is longer and squatter than the woolly mammoth (its back doesn't slope like a mammoth's).